Good news from the street! Is it ever going to stop raining and is the humidity ever going to drop below way-too-sticky? Outside the MAS windows, the city is shrouded in grey and the sky reverberates with thunder. But every evening when I return home to my neighborhood of Jackson Heights I am struck by how beautifully scaled it is–and how much cooler it feels than the Manhattan I have left behind. 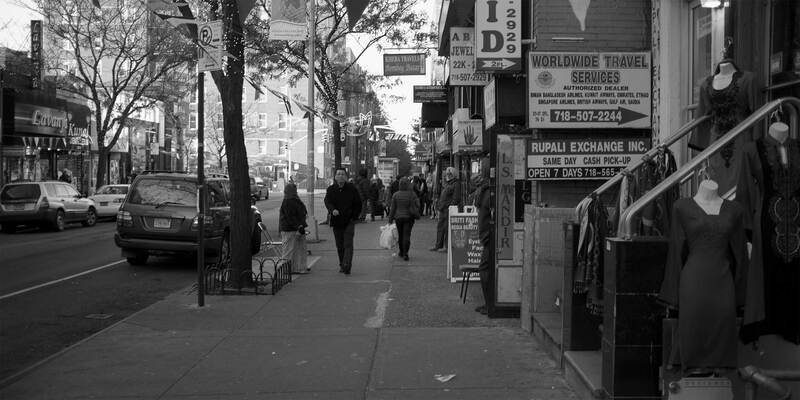 There is nothing static about Jackson Heights, it is dynamic in the extreme, but the historic district gives it a peaceful center of regular life lived many different ways. It creates a great sense of place that leads to pride of place in the best New York way. So it upsets me to hear historic preservation too often denigrated as a pretense for achieving community stasis or a method for standing in the way of progress. A street in the Jackson Heights neighborhood of Queens. Photo: Creative Commons, Aleksandr Zykov. Modifications: Image cropped and transformed to black and white. Luckily, this week, we have real progress to celebrate. Today, the Landmarks Preservation Commission (LPC) voted to allow for circulation of the revised Rules Amendments to the public. The issuance of the revisions will be followed by another public hearing, providing an opportunity for New Yorkers to weigh in on the changes. This came in response to a request from MAS, the New York Landmarks Conservancy, and the Historic Districts Council. We are grateful to Interim Chair Fred Bland, and Commission’s senior staff: Sarah Carroll, Executive Director; Mark Silberman, General Counsel; and Corey Scott Herrala, First Deputy Director of Preservation, for delivering this small but important triumph of transparency over expediency. This decision stands out for its thoughtfulness about the risks and rewards of taking a little longer in exchange for better public understanding and engagement on the decisions before the Commission. In the end, there may remain plenty to agree and disagree about, but we are confident that the dialogue will get the Rules to a better place. This democracy thing is tough. It is hard to balance the real need to get decisions made and implemented against the inevitability of push back. It is all too easy to say that we did our job and heard the public out and now we are moving on. But in the end, the review process is there to avoid the avoidable mistakes. It should be about ensuring policy that seems to make so much sense to people who breathe it in, day in and day out, also makes sense to the end user. In the case of LPC, those end users are a wide variety of people with very different understandings of historic preservation and the designation process. The new Rules need to serve private citizens wanting to improve the place they live or work, professionals (architects, archeologists, engineers, conservators, developers, etc.) and the advocacy community, to name but a few. These are really different audiences. It is no wonder it is hard to speak to all at once about something that is fundamentally technical. And, of course, all the more reason to welcome the input and voices of all these different audiences before you set it in stone. We look forward to providing thoughtful comments on the revised Rules that will hopefully bring us closer to a true community-wide sense of pride in our Landmarks Law.